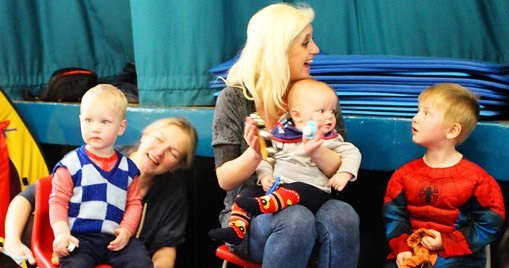 Playgroups are a great way to meet other mums in Sutton with children of a similar age. Mums that you meet at playgroups can form a vital support network as your kids grow up and start attending local schools together. Playgroups are ideal places for your kids to socialize. During the morning we gather together for Storytime where the children hear a story including Bible stories and can express themselves through singing and action songs. The cost for the morning is �1.50 for adult and child and 50p for additional people. Wednesdays 10.00am-11.30am during term time only. We sometimes have a waiting list for this group. Please contact Lisa or Hilary for more details. Monday afternoons in termtime 1.45-3.00pm. Small, friendly group. Safe, welcoming place for children to play with lots to do while parents make new friends. New members welcome! 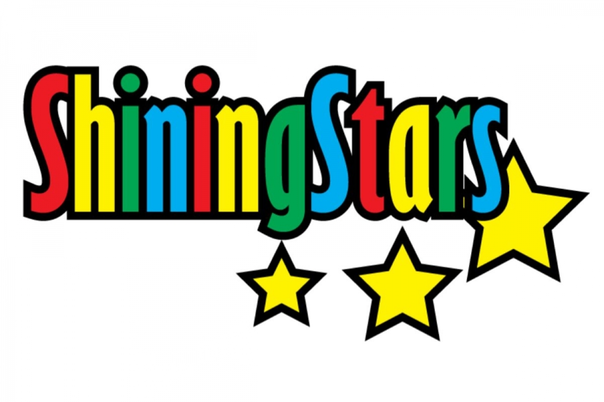 This group is for ages 0 to 3 only.�There is currently a waiting list so please call first. Opening Times: Tuesdays - 10.00am to 11.30am and 1.30pm to 3.00pm during term time only. Also there are a wide selction of ride-ons, toys, books and different crafts each week to keep any age amused while you have a coffee and a chat. Non-religous volunteer run group welcome to all.�There is no waiting list, although does sometimes get busy so first 20 only are admitted. Opening Times: Thursdays - 9:30am to 11am all year round! Very relaxed & friendly group - help yourselves to tea and coffee and biscuits from the kitchen. Structured activities, including outdoor play, are provided by qualified cr�che workers for older children, whilst mums and babies relax.This small inclusive group aims to keeps numbers to a minimum so that they can provide best quality of attention to children and no mum gets to feel left out. Please ring or email to register your place in advance. You will be sent an application form. There is currently a waiting list for Thursdays, but there are places available for the Monday playgroup, this will run until April, but may be extended further depending on funding. Every Monday term time, 10-11am for toddlers and parent/carers, at Back Door, The Secombe Theatre. It is an interactive session with singing, movement, a story and refreshments for parent/carers. The first session is free and then �20 for a full term. 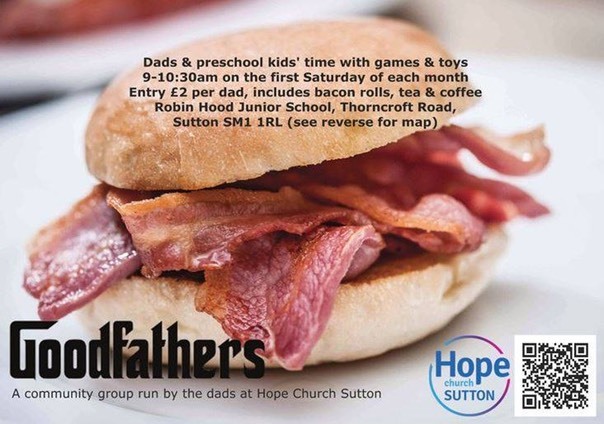 Email to register your place:�hopehoppers@hopechurchsutton.org.uk. Check www.tazza.co.uk for more details. Story time geared for toddlers at 188 High Street (above TazZa Coffee) pram park - excellent coffee, cakes and nibbles at TazZa. A friendly group very near to Sutton shopping center and local schools. Open to mums, dads, grandparents and carers. A place for mums to meet, babies to play and friendships to be formed. No toddlers please. We do however welcome expectant mums as well as mums with babies.�We aim to be a safe and welcoming place for mums who feel their babies are not old enough for toddler groups, but who would like to meet others at the same stage. We're equipped with baby mats, toys etc and provide drinks and biscuits for adults.�The Nest is run and staffed by a team of voluteers from Horizon Church Sutton. Opening Times:�Open on Thursday afternoons from 1.00 to 2.45pm (term times only).NB We ask that you move on to a toddler group when your child is walking confidently. This will probably mean at around 15 months, but because we recognise that babies develop in different ways and at different times we do not prescribe an age as such.Please note that the U shop has no toilets, so please use those on 3rd floor of St Nicholas Centre. We do however have a table for nappy changing. The group is run by volunteers from Vineyard Church Sutton and from the local community. We endeavour to provide a safe and enjoyable place for children and their parents or carers to play, learn and socialise. We provide a range of stimulating and age appropriate toys and activities including a role play area, playdough and craft activities, ride-ons, baby playmats, an outdoor play area, song time and much more.�We would love to see you there. Opening Times:�Children are welcome from birth to 4 years and the cost is only �2.50 per family including refreshments.�We are open on Mondays - 9.45am to 11.15am and Tuesdays 9.45-11.15. Both groups are popular on Monday and Tuesday with waiting lists, but do feel free to visit and we will put your name down. Toddler Time is a friendly community group open to all pre-school age children, parents and carers led by volunteers from the church. Opening Times:�We currently meet two mornings a week [Tuesday and Wednesday] from 9:30am - 11am term time only, with time to play, sing, laugh, eat, make new friends and support each other. Booking in advance is essential and can be done online through our website! Our friendly team will register your details during your first session. Doors open at 9:30 but you are welcome to come and enjoy a pre-Toddler Time drink in our fair trade coffee house, Tariro.�Visit www.suttonsa.org and click on Toddler Time to book online! Please also enter your email address on the homepage to subscribe to our email updates. Very friendly staff and parents. There is a big play area including a see-saw, a slide, children's prams, push along toys. Also there are some activity tables including jigsaws, playdough and a whole variety of craft activities on a rota basis.At each session there is a story time with biscuits and drinks. At the end there is a fun song time which includes the opportunity to celebrate birthdays. Opening Times: It is open on both Tuesday and Thursdays between 10.30am and 12pm term time only and Thursday between 1pm and 2.30pm for 0 to 4 year olds term time only. 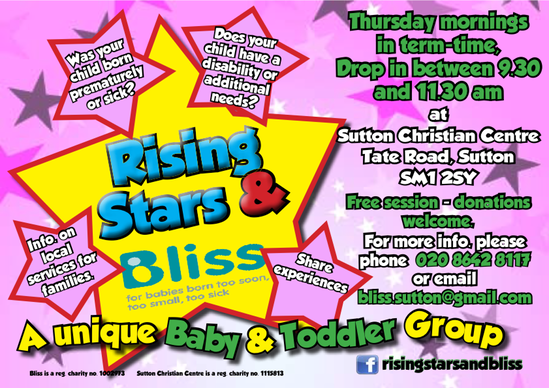 It is open on Tuesday between 1pm and 2.30pm for Mums with Babies 0 to 18mths term time only. Contact: For more information contact Sheila Booth telephone 020 8715 0514 or email m.s.booth@blueyonder.co.uk. �Please contact us to join a waiting list - please don't just turn up.